Since arriving in Brunei, I’ve been very inspired to write. I have been working on this blog, but have also started working on a book, have done a writing workshop, joined a writing circle, read books and blogs about writing, and have considered how I might get articles published. You might think that with all that writing, and with two spare rooms in our little house, I would have a nice space set up. A desk, some inspiring pictures, calming music, and nice ergonomic set up to prevent pains and strains. That all sounds pretty good actually, but the reality is quite different. Where I write. 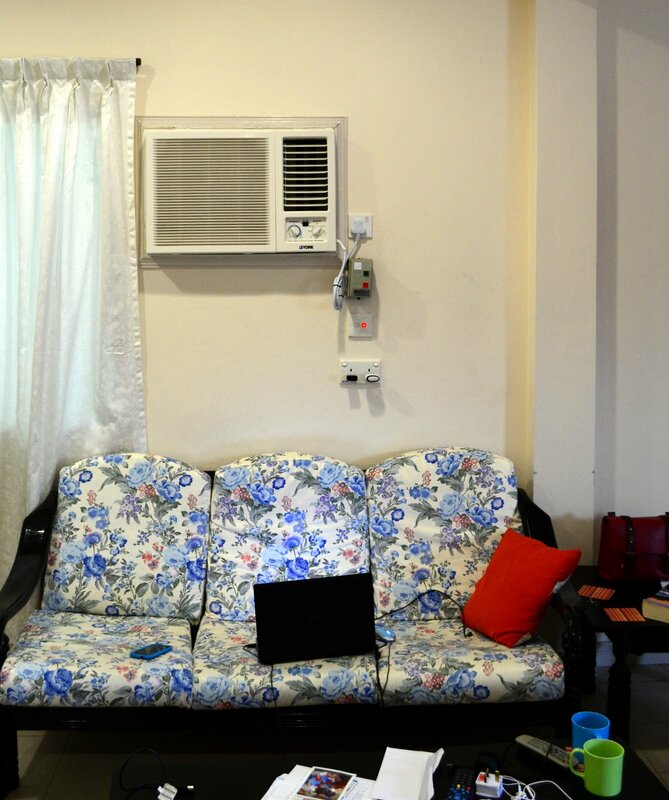 Our apartment in Kuala Belait. Air conditioning. An absolute essential for this Antipodean. I am definitely not used to the tropics yet. Amazing couch. We didn’t bring any furniture with us, so rented our apartment furnished. The provided lounge suite has a fairly interesting pattern. I love it and am scared by it in approximately equal parts. Coffee table. Useful as a foot stool and for storing random bits and pieces. Todays clutter includes two amazing letters that I got this morning, and absolutely made my day. Both because they prove that our address works, and because they were great letters. The view from where I write is equally uninspiring. What I look at as I write. As you can see, with this there is really nothing to note. The wall is blank (it’s hard to find posters here, and we haven’t thought of any other wall decoration ideas that we can use for our concrete walls). 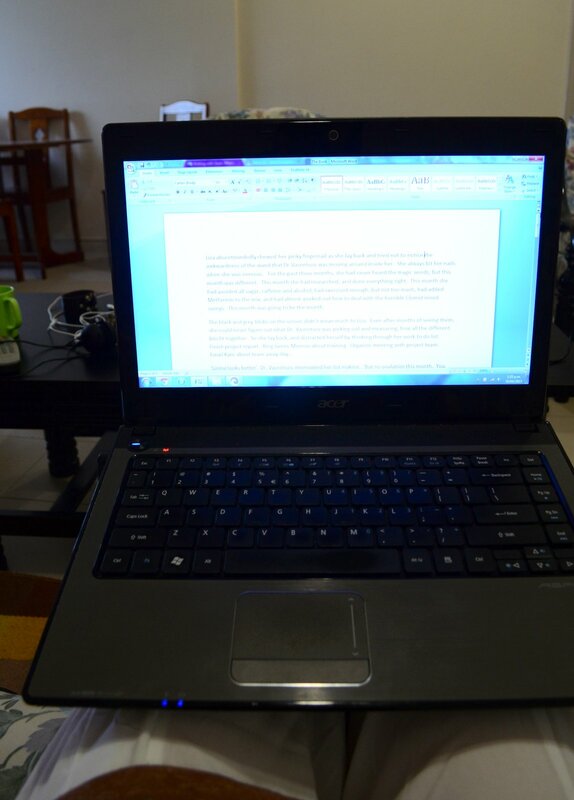 The laptop is on my knee, which creates a somewhat awkward angle, and strains my shoulders if I write too long. I then have to do yoga to stretch them out. We don’t get much natural light, so the lights are always on inside. So basically, it’s amazing that I am inspired to write, because it’s certainly not from my surroundings. In fact, putting this out there, and thinking about it a bit more, I think that it has to change. I’m serious about this writing lark, and I should put some attention to it. Project Makeover My Writing Space starts now. Who’s got ideas for me? It was a pretty busy week in our household last week with me at yoga all week (it stayed just as amazing by the way. Inspired! ), and The Engineer working hard. So when we got to Friday afternoon (our usual challenge completion time), The Engineer didn’t have anything planned for my challenge. I kindly offered him one that I’d be considering for him (the Century Egg), but there were none in stock in the supermarket. I was glad (definitely rather him than me on the century egg front), but it left us in a bit of a sticky situation. Fortunately, despite the fact that our supermarket is very westernised, there are still some interesting Asian things around. 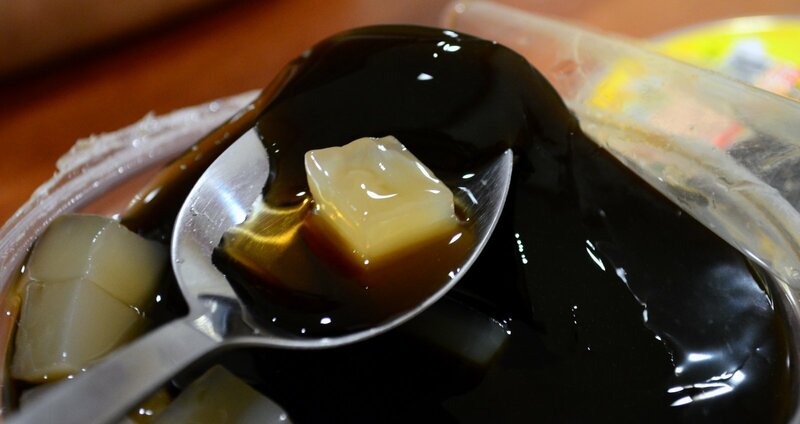 We considered weird drinks, various fish flavoured snacks, and some odd looking cakes, but the thing that really caught The Engineer’s eye was Grass Jelly or Chin Chow. 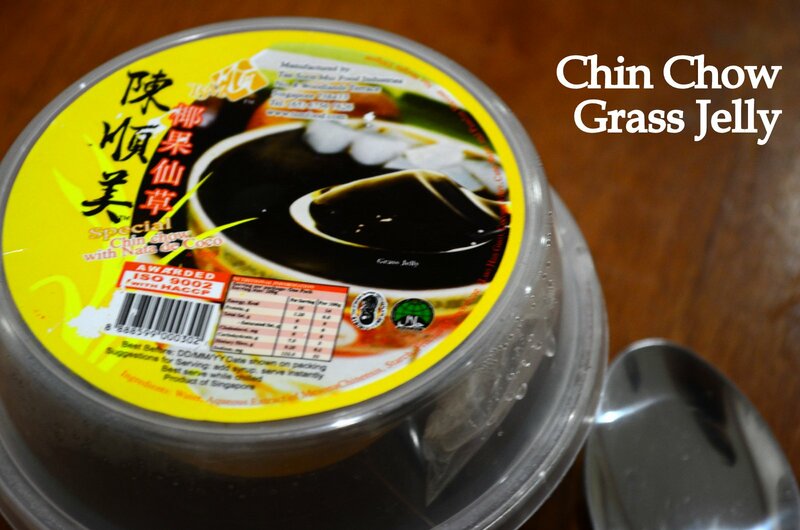 We had tried grass jelly drinks previously (at the Hash running), and I was pleasantly surprised. So I thought I was getting off pretty easy this week. There were a few different flavours to choose from, and we chose Nata de Coco. I foolishly thought that Coco might be chocolate flavoured. 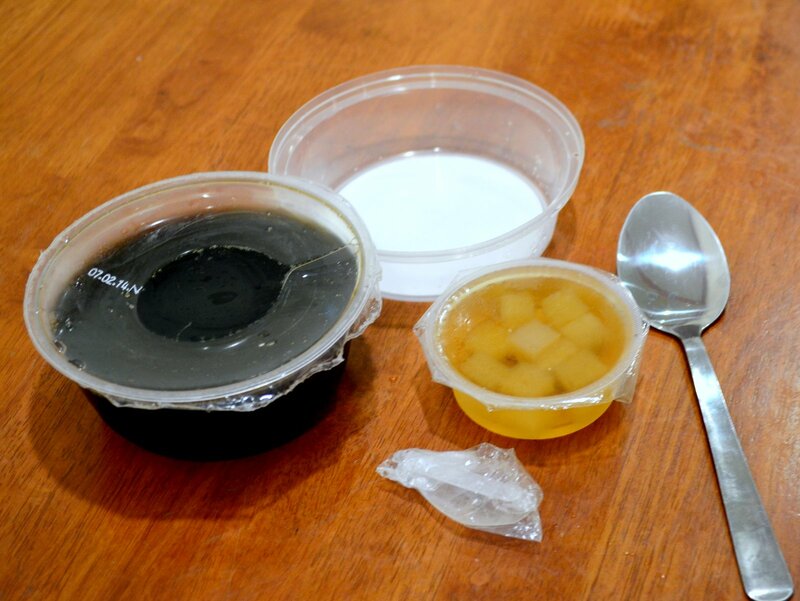 But actually Nata de Coco is fermented coconut in syrup. The instructions said to add all the syrup to the jelly, and enjoy, so I did. The jelly actually wasn’t too bad. It looked a bit soft, but had a good jelly texture to it. And it hardly had any flavour at all. The syrup/Nata de Coco, on the other hand was not at all pleasant. Way too sweet for me, and with a really weird flavour. I gave it a few chances (and pulled some funky faces) before admitting defeat, and concluding that this was not going to be the dessert for me. I’ll stick to having my jelly raspberry flavoured, I think! 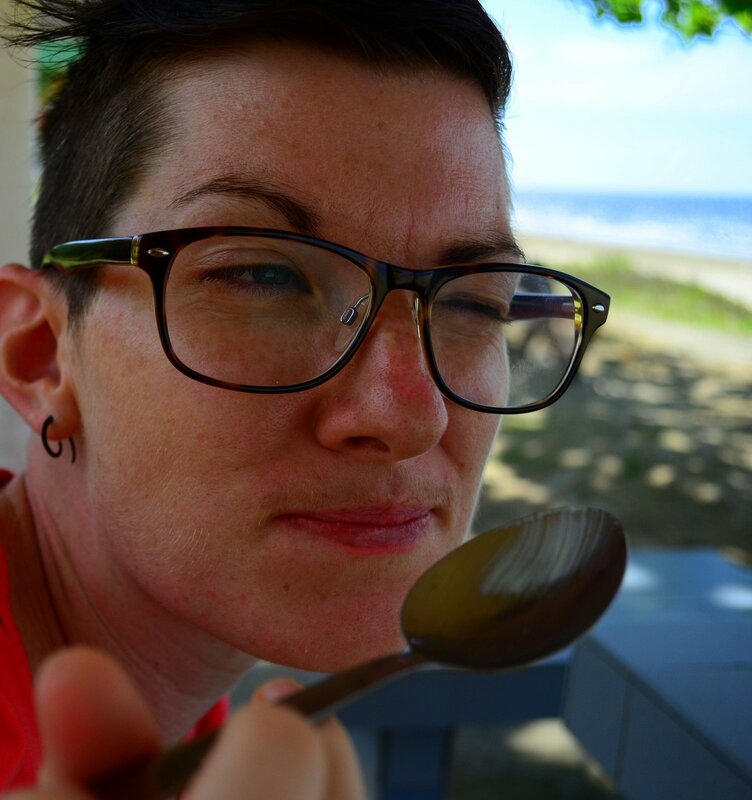 Ever since we were first looking into moving to Brunei, I have been keeping an eye out for bloggers who are here, and with whom I might have something in common. So when I received a comment a few months ago from Jo saying that she was coming here, and since we were both writers we should meet up, my response was (of course) “Heck yeah” (although I probably didn’t use those exact words. It took a while for logistics to work in our favour (lack of internet, lack of phones, busyness at different times), but about a month ago, we managed to meet up. She was the first person I’ve met from the blog, so I was a tiny bit nervous, but within a couple of minutes, all nerves had disappeared. She was friendly, helpful, and great to talk to. So over the last few weeks I’ve been reading away, and working through the exercises. And having reached the end, I can say that this is an excellent resource for anyone wanting to find a career that works for them. The focus is clearly on trailing spouses, but the advice and exercises would apply to a far wider audience. The book is a collection of personal stories, practical advice, exercises, and food for thought, all focused on how trailing spouses can create a career that they can take with them wherever their expatriation takes them. And more importantly on how they can create a career that suits their needs, ignites their passions and lines up with their values. It was this focus on passion and values that really drew me into the book. This has been a key focus of my personal career journey, and something that I think is often overlooked, even though when you read about it, it seems so damn logical. The book leads readers through a journey of discovery, and is supported by a number of different exercises and assessments to help with thinking. From my experience, these are absolutely critical. It’s quite one thing to say “Figure out a career that interests and inspires you”, and quite another thing to actually make that happen. The supporting exercises in A Career in Your Suitcase are a great way of transforming that basic instruction into something that you can actually act on. The variety of assessment and exercises is great, but there is definitely a lot! So my recommendation to any client working with this book (and the approach I took) is to select the exercises that really resonate with you, and put your energy into those, rather than worrying about doing everything. Given my experience with career change and career development, a lot of the exercises and thinking weren’t completely new to me. But there were still several parts that clicked with me and interested me enough to pull out the notebook. One part in particular was the exercise that asked you to write a story about your career thus far and look for connections and themes. This is one of my favourite exercises to use with people, and lines up so well with my thoughts on what career means that I was really glad to see it included. Overall, I thought the book was a great guide. I worked through it quite quickly, but I think it would be really worthwhile to take time working through the steps. In fact, I’m pretty sure that I’ll be picking it up again in the coming months. For now I’m pretty happy with a suitcase that is so filled with yoga that there’s not really room for a career in there. But I will definitely be turning to this book when I get to the stage of working out what the career in my suitcase is going to look like. 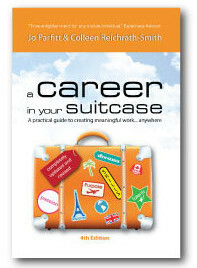 And a tip for anyone interested: If you buy A Career in Your Suitcase online 12-16 May on Kindle, it’s absolutely FREE! Check it out! 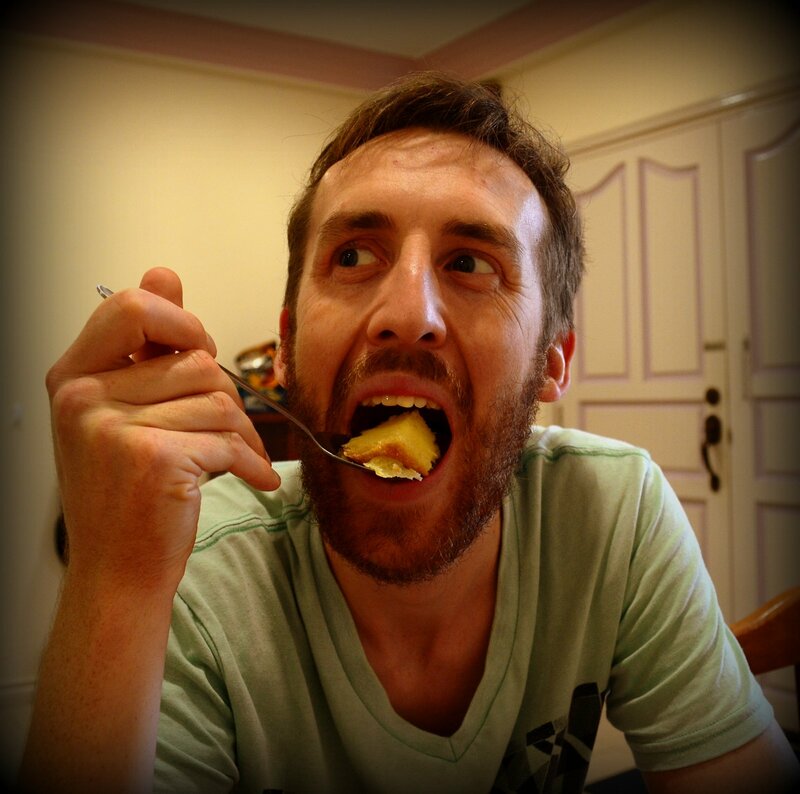 This week it was my turn to challenge The Engineer (insert evil laugh here…). And going by the title, you might well think that I went pretty easy on him. Cheese cake sounds pretty harmless. In fact, it sounds quite delicious. But the trick is all in the spacing. This was not cheesecake: creamy and delicious dessert loved by millions. It was cheese cake: cake with cheese on top. 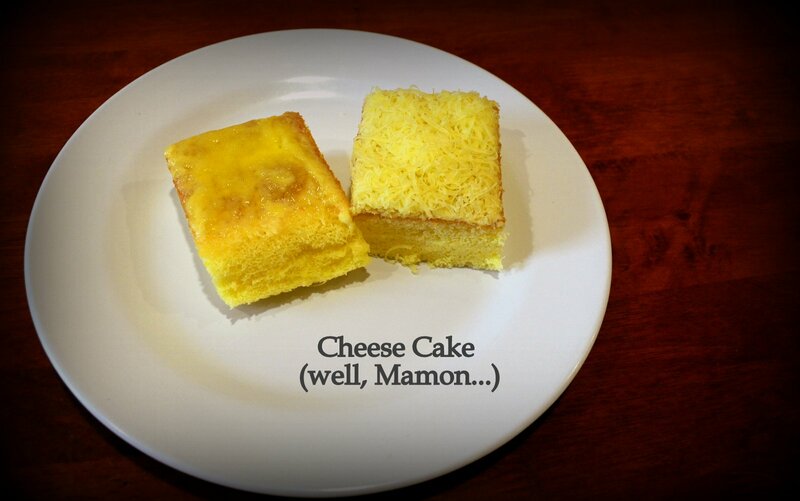 In fact, it was actually a Filipino Mamon cake (a light fluffy sponge cake) with cheese on top. And I’m no stranger to cheese and dessert. Apple pie with cheese cannot be beat (I know, I know… It’s weird. But surprisingly delicious). But anyway, my point still stands. In New Zealand, this would be considered weird. An interesting dessert: Cheese Mamon. First thing we wanted to know when we brought this bad boy home was whether we should melt the cheese or not. We googled, and found out all sorts of things, but nothing made it completely clear. So we decided to hedge our bets and try half of each. Should we melt it or not? Who knows… Let’s try both! And once half had had a few minutes under the grill, and was lovely and melted, all that was left was to try it. The smell was pretty strong, so The Engineer (who is decidedly NOT a fan of cheese desserts, even the awesome ones) was not super excited about the idea. But he powered through, and gave it a go. He tried it straight first, and was not pleased with the results. But he found the melted version far more palatable. The Engineer and his cheesy dessert. We do not recommend this cake! Once I had tried, The Engineer had to have one more bite, because it was his challenge. And we had a little nibble without the cheese, to see how that was (much nicer, unsurprisingly. And then, we were delighted to throw it in the bin! (We felt a little bad about the wastage, but mostly glad to be rid of it). When we decided to move here, and found out that I most likely couldn’t work, one of the things I really wanted to explore was yoga. I downloaded a hatha yoga app while I was staying with Mum in Napier, and quickly saw the benefits of daily practice. I was stronger, calmer, and feeling great. But when I arrived here, the app was no longer doing it for me as my only practice. I needed the support of a teacher, and to be around people. So I started researching yoga retreats, thinking that with all my free time, I might take the opportunity for a yoga holiday. Turns out most of those are a little bit expensive for me, but I had fun exploring the options. Then, as soon as we got our memberships to the Panaga Club, I signed up for the yoga section. When I went in to sign up (this was Friday), I asked whether I needed to do anything else, or whether I could just show up to the class on Monday. Lucky I did ask, because the response: “I don’t know about on Monday, they’re having a course next week” (handing over information and timetables as he spoke). As we left, I had a read through the information. Not only did the course look amazing (meditation every morning, two classes per day, a workshop every day) and resemble the retreats I was eyeing up, but the instructor was from Bali, from the same place that I most wanted to retreat at. It was meant to be. When we got home, I quickly emailed to book, and crossed my fingers, half expecting an email back saying “No, fool, this course is full . Why would you try to sign up two days before it starts?” So when I got the response the next morning letting me know that I was booked in (to all except three of the most popular classes), I could hardly contain the excitement. Along with the excitement came a little bit of nerves. Where did I go? Who else would be there? Would I be the worst? etc. New situations can be tough. On Sunday night, I had nearly talked myself out of the first meditation (“too early”). But this morning I got up with The Engineer, had breakfast, and was ready to go just in time. So I bit the bullet and headed off (with some words of encouragement from The Engineer, and the option to not go in and read my book until class started if the meditation was too daunting). Of course, none of the worries came to fruition, and any nerves were just wasted energy. (This is one of things that I KNOW in my head, but can’t quite believe in my heart). The meditation was seated, for an hour (ouch, my back! ), and focussed on Gratitude. It was powerful, and not too hard (apart from a few pins and needles/position adjustments). People were friendly, and the instructor was amazing. So far so good. The Vinyasa Yoga class was great. It struck a perfect balance of challenging and manageable, and I was not the worst/most unfit in the room (not that I would compare). The 90 minutes flew by. But I’ve never really understood them, or how they apply to my life. The 90 minute discussion of them was eye opening, fascinating, and energising. I was pleasantly surprised, and the workshop was the highlight of the day (so far). I’ve still got a Hatha Yoga class remaining today, and four more classes, four more meditations, and three more workshops to take me through the week. I’ve got some new yoga clothes to get me through (it’s a sweaty business, yoga in the tropics). I can’t wait. And best of all, I’ve got a whole load of inspiration to take into planning my yoga holiday, for which I might have a partner in crime (my wonderful little sister!). Our third weekly challenge, and first joint challenge, was one that came to us very early in our time in Brunei. 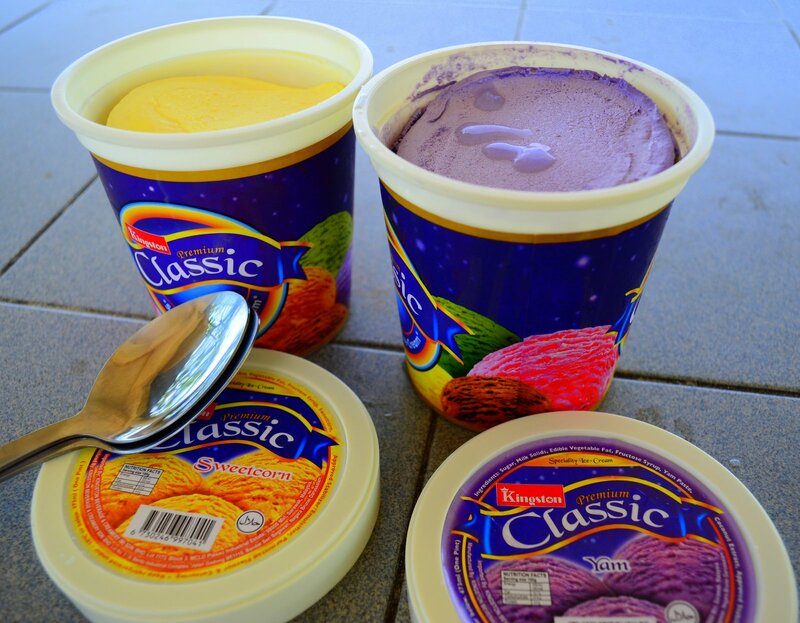 Just a few days after I arrived, we were browsing the ice cream freezer at the local department store and noticed a bright purple ice cream. Curious, we looked closer and noticed that it was yam flavoured. And its yellow neighbour was sweet corn. They were only available in two litre containers, and I don’t really eat dairy, so we couldn’t justify buying that much of something that sounded disgusting scary interesting. But they stuck in our minds, so when our first joint challenge came up, and we found 200 mL containers of them at the supermarket, we knew this was it. On Friday afternoon, we stopped by the supermarket, and picked up the supplies for an ice cream picnic at the beach. Breaking out the yam and sweet corn ice creams at the beach. It was a beautiful afternoon, and a beautiful setting, but we were nervous about what was ahead. 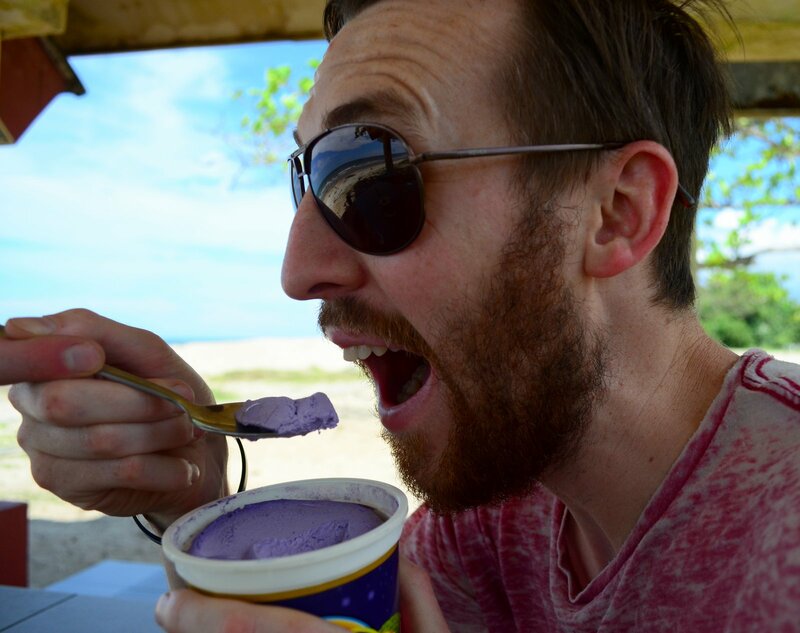 We didn’t really even know what a purple yam tasted like, and we couldn’t imagine how ice cream could be sweet corn flavoured. Would it just be like canned sweetcorn but colder? Would it be chunky? 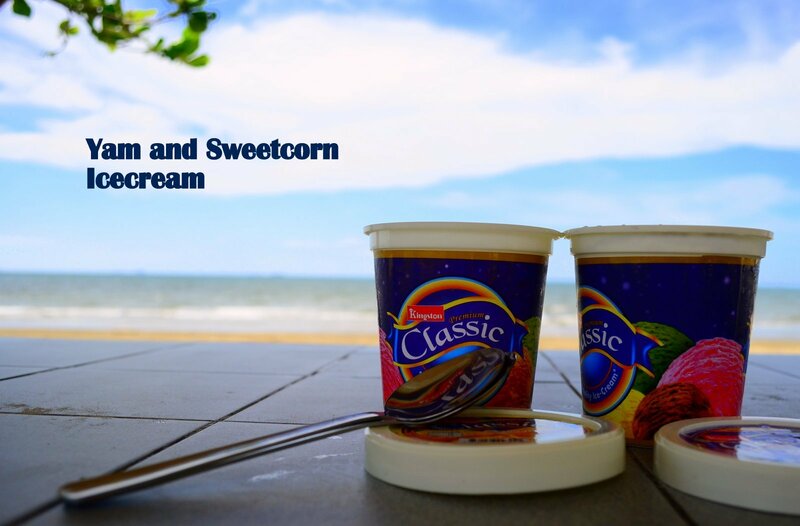 Yam and sweet corn ice creams. Rather than wondering too long, we cracked them open. We were glad to find out that the ice cream was smooth (mostly, there were a few small pieces of corn), and they didn’t look too scary. The Engineer and some yam flavoured ice cream. Pondering the sweet corn ice cream. We switched, and discussed. The sweet corn was sweeter. The yam was almost coconutty. But both were creamy, smooth, and basically just good ice cream. They didn’t taste vegetable flavoured, or weird. They may not have been my first choice, but they were both nice. After we’d eaten our fill, we had to decide whether or not to take them home, and came to the conclusion that they were good enough to eat again, and had made the cut. They went in the freezer. For a while now, The Engineer and I have had a tradition of Alphabet Date “Nights”. Every week couple of weeks month once in a while we set aside some time to get out, turn off the TV and the computer, and do something fun. The dates follow the alphabet (first was an Afternoon at Arborio, second was Beer at the Bar etc. ), and we take turns organising them (The Engineer took me for Hiking and Hotdogs, so I took him for Icecream). We whizzed through the whole alphabet in 2010/11, and have been a bit slower getting through the second time around in 2012/13. It has been my turn to organise an N date for a ridiculously long time, so this weekend, I decided to finally do it. I thought of a few different options. There is a lot of New stuff around us at the moment. Most restaurants would serve Nasi. But when I finally got my multi-entry visa stamped in my passport (more on that another day), and we realised we could go to Malaysia for the weekend, I decided on the final date: a weekend in Nature and a visit to the Niah Caves. So on Friday afternoon, after completing our weekly challenge, and putting our paperwork in at the Panaga Club, we packed up and headed over the border (more on all of those another day). We arrived in Miri in the afternoon, and had a look around the Bintang Mega Mall. Then we headed down to the waterfront for a seafood dinner. We ordered WAY too much food, tried pako (edible fern) for the first time, and wished it was light so we could see the view. Then we headed to our accommodation, the Treetops Lodge. The lodge was awesome. We stayed in the longhouse, and on the first night we had it all to ourselves. Our room was basic, but nice, and came with a mosquito net and a fan (essentials). The internet was free, and they even had a network with TV shows and movies available, although we didn’t have our laptop and couldn’t make use of those. The breakfasts were well organised and cheap. In fact, the only negative thing about the place was the fact that the first morning, when we woke up, we found that our fan had killed a bat in the middle of the night, and it was now lying on the floor beside our bed. On Saturday, we headed out to Niah Caves. It was pouring with rain most of the way there, so we were pretty glad when the clouds cleared just as we arrived. 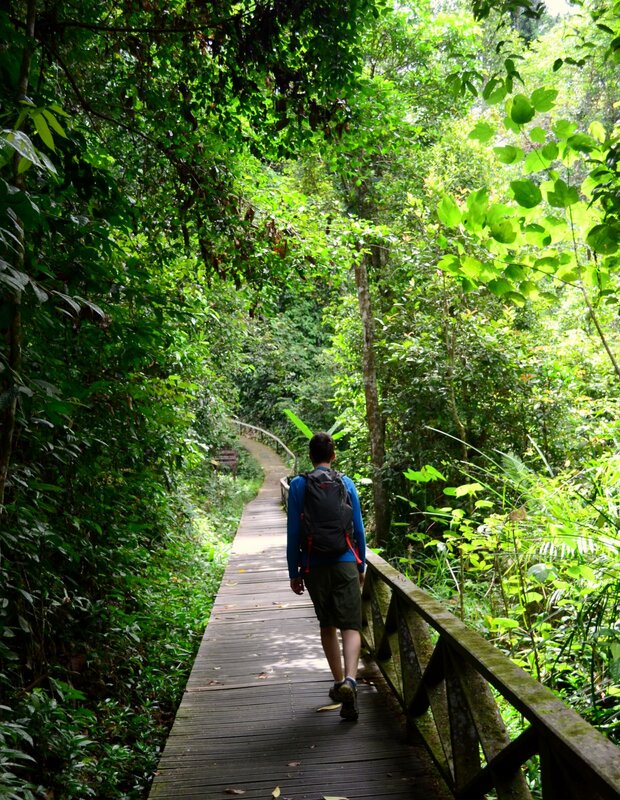 The park starts with a 3 km board walk through the rainforest. It was lovely, but I think that I have been spoiled by being a New Zealander, in that I always expect the jungle to be more impressive, more different. In reality, apart from the heat and the creatures, it’s pretty much like the bush at home. Walking through the boardwalk to Niah Caves. The creatures really do set it apart though. During our walk, we ran across butterflies, lizards, monkeys, red millipedes, bats, and birds. Most were a bit hard to photograph, but they definitely kept the walk interesting, and were a slight distraction from the heat. 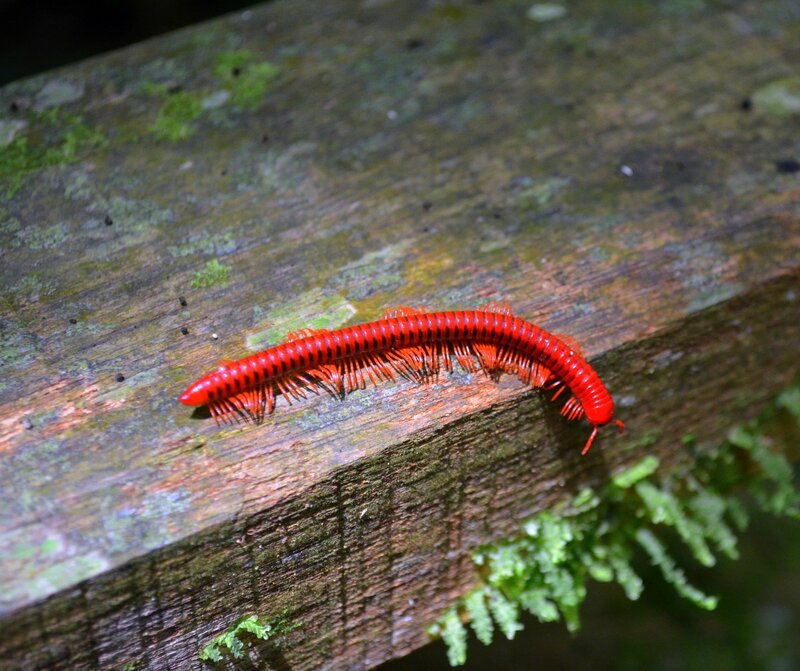 Red millipede at Niah National Park. 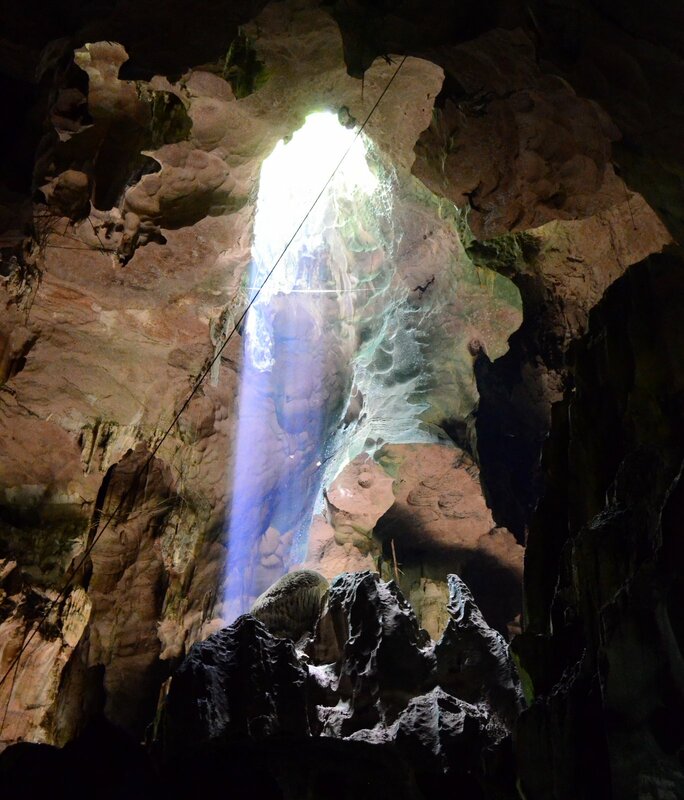 Stream of light in the Great Cave at Niah National Park. We got some funny looks when we passed people on the boardwalk, with me gripping The Engineer’s backpack so that I didn’t lose footing; I discovered once again that I’m kinda scared of caves, and that doing something for the second time is always much easier; we were surprised by the noise and smell of the bats; I found it much harder than I expected for a boardwalked tourist spot. But overall, we loved it. And we really loved the 100 Plus that we bought from a stall just outside the caves in the middle of the jungle. And we really really loved getting back into an air-conditioned car, and getting some lunch. 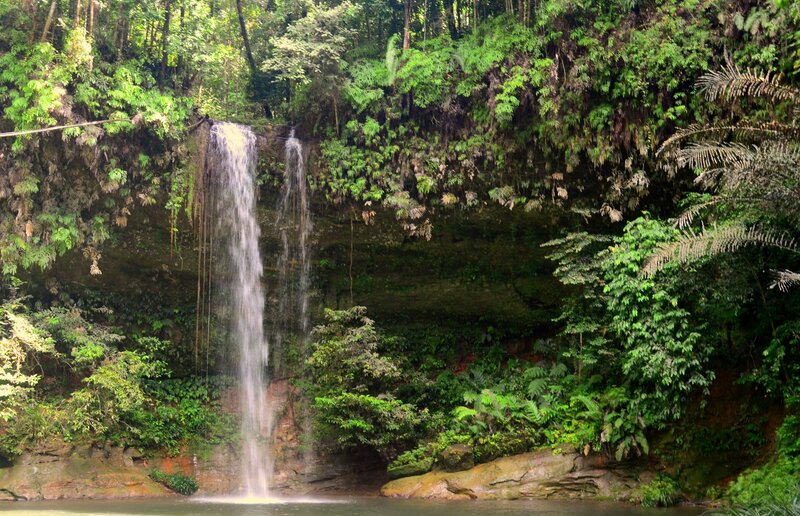 The waterfall at Lambir Hlls National Park. And now it’s The Engineer’s turn once again to plan a date. Something beginning with O. Anyone got any ideas for him? This weekend marks the end of my first month in Brunei. 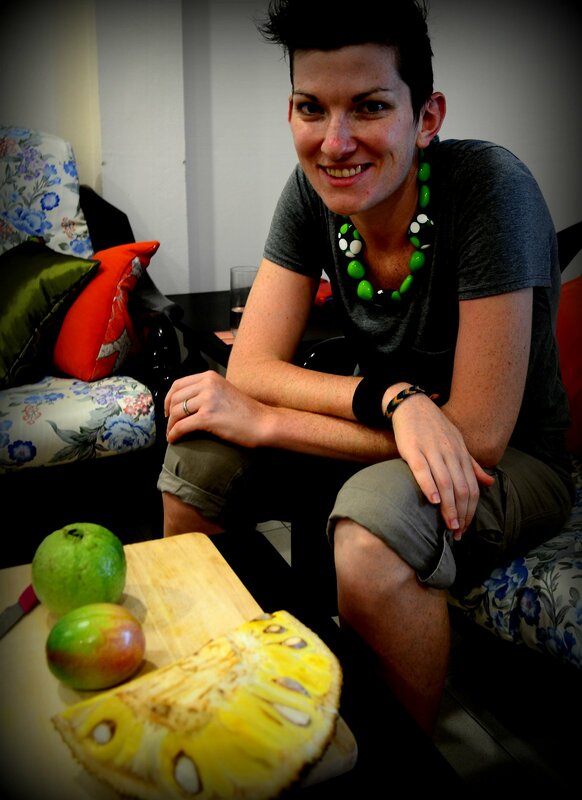 This is an interesting time in my expat journey. I’ve been here long enough that I know my way around, and am definitely getting used to the place. But I haven’t been here long enough for it to feel like home, or to feel settled. I still feel like a visitor. I still don’t believe it will be warm all year round, and I’ll never have to say goodbye to watermelon season. And this seems like a perfect time to write a little summary of what I’ve found so far. 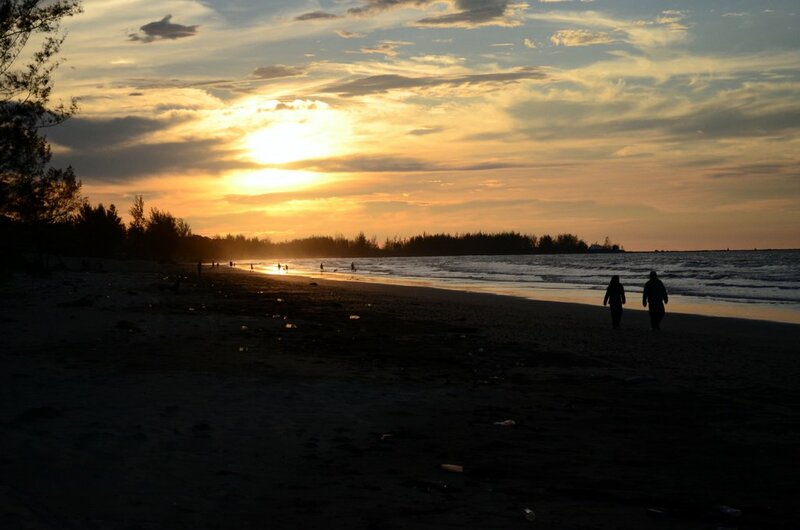 Sunset at Kuala Belait Beach. The sunsets are amazing. Almost every night they’re amazing. And they come at a perfect pre-dinner-walk time, so we often get to see them. We are so close to other countries. This weekend we are heading to Malaysia. It will take about an hour to get where we’re going. And we didn’t organise it until yesterday. This is a total revelation for someone used to being a 3 hour flight away from anywhere. The people I’ve met so far have been lovely. Everyone has been really friendly and keen to help. I have had tips of where to go, where to find things, what to try, and how to get things done. The food is cheap. We can always get lunch for the two of us for under $10, usually including drinks. Sometimes it’s under $5. Even at the expensive restaurants, a couple of courses plus drinks is usually around $50. It’s warm. All the time. Even at night, I don’t ever have to think about taking a jacket (except occasionally a rain jacket). I haven’t met many people so far. It’s hard in a small town where you’re obviously foreign. And not being the kind of person who walks up to people with no reason and starts chatting, it’s a challenge. But it’s still early days, and I am hopeful that membership at the Panaga Club will help matters! My people at home are in a different time zone. I know this is obvious. But sometimes I just want to pop onto Facebook at 8:30pm and see what’s happening, maybe chat to someone. Problem is, at 8:30pm my time most people are in bed, and nothing’s really happening! There is rubbish all over the place. The river is polluted, the streets are littered, the parks hold unpleasant surprises. Sometimes this tarnishes the absolute beauty of the place. It’s humid. The warmth is nice, but the humidity makes it challenging at times. It takes me about 7 minutes to walk to town, with no hills or anything. But by the end of the walk I’m usually pretty sweaty, and ready for some aircon-action. There are stray dogs, and lots of them. And even the non-stray dogs bark way more than dogs at home. Our neighbours dogs sometimes escape onto our property, and there have been a few dog fights. The other day I got followed for a couple of minutes on my way home by a barking dog, and had to be pretty careful to keep my eyes ahead and not make it worse. It’s hard to know where to buy things. The hardware store sells ice cream. The book store doesn’t sell maps. The department store sells anything, but not everything. By looking and asking around, we have found everything we need. But shopping is certainly not what I’m used to. I guess you could count the rubbish in this category, but really there is nothing ugly about life here so far. It’s fascinating. And of course it’s very different. But even the bad things are not really all bad. They’re just different to what I am used to. 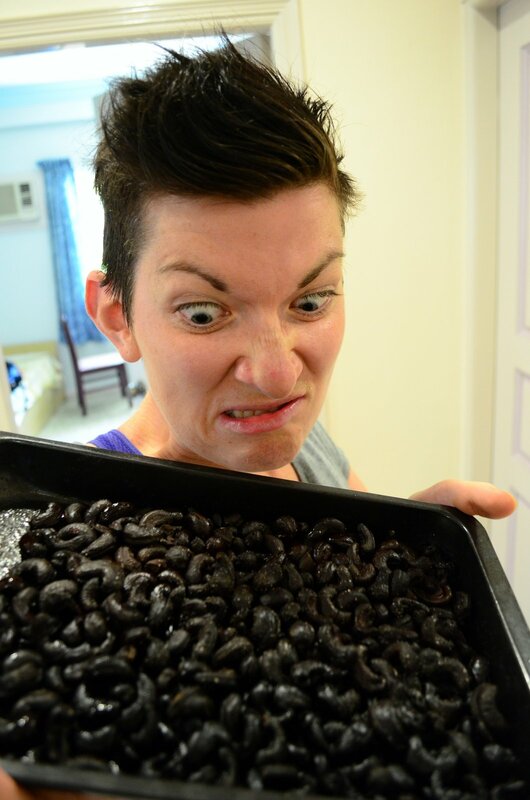 The ugliest thing I’ve taken a picture of so far is my face when I realised that we had burnt a whole tray of cashews that we were supposed to be roasting! The Ugly: Oops, we burnt the cashews. Last week I brought you the first of our Weekly Challenges, the Sardine Donut. It was not an easy one to start with, although the results were not as bad as they could have been. Or even as they should have been. Best of all, the donut didn’t scare us off, and last Friday afternoon (great time for a challenge, with The Engineer finishing work at 11am), we headed out to the Seria Market for challenge number two. This one was set by The Engineer, and was for me. And I have to admit, I was grateful for how nice he was to me after the Sardine Donut. 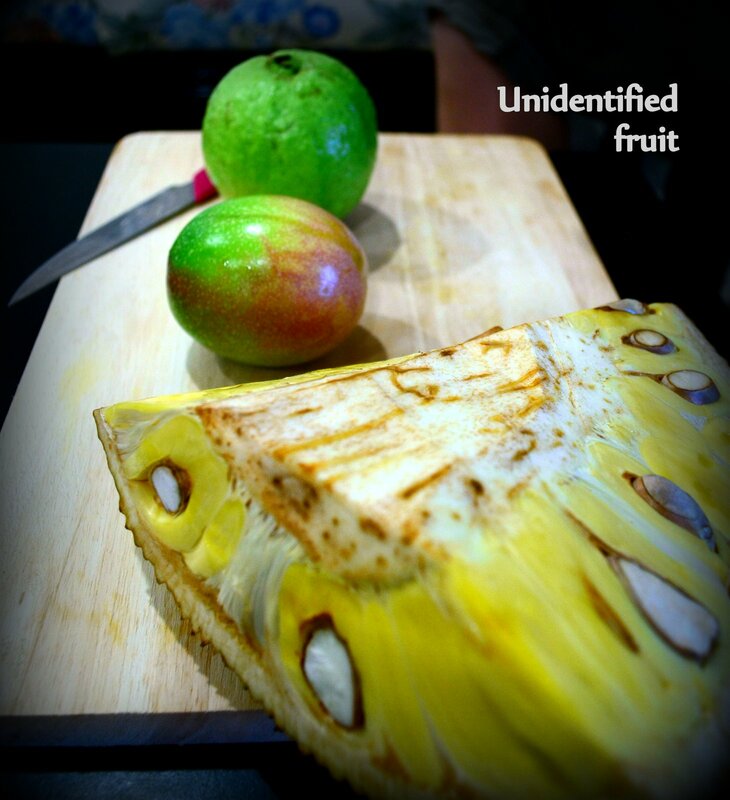 My challenge was to purchase a fruit that I could not identify, and try it. Me and my Weekly Challenge. A selection of fruit to try. 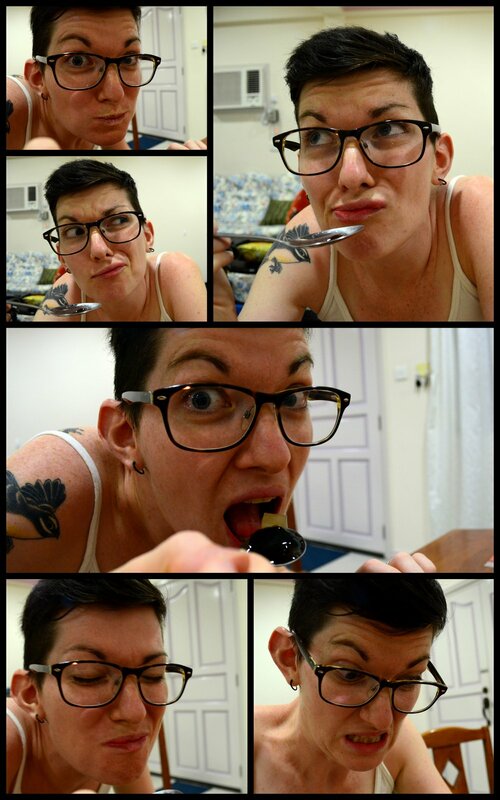 The jackfruit was weird. It had a strong, sweet, sticky smell and flavour. It was not entirely unpleasant, but not entirely pleasant either. As someone not too fond of many tropical fruits, I would certainly not be putting it on the shopping list, but I didn’t stop after the first bite. 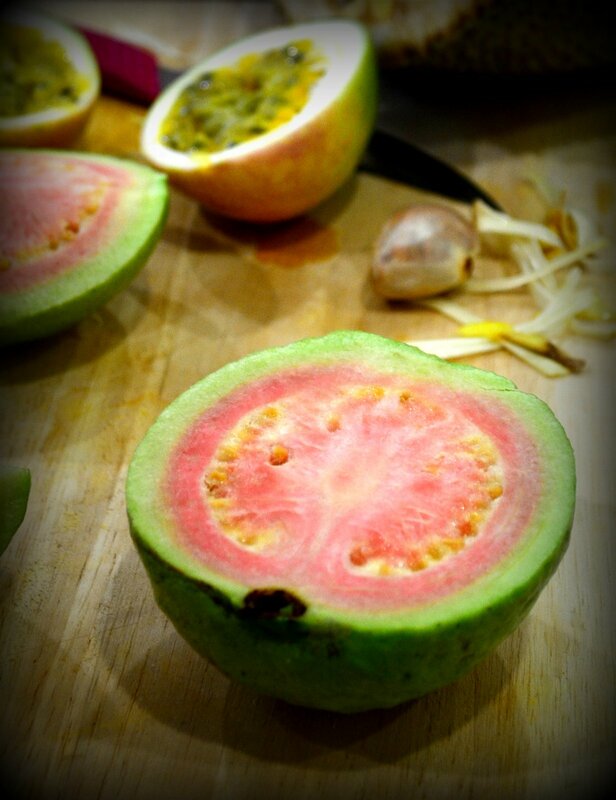 The passionfruit was delicious. I have never been a huge fan at home, but this one was super juicy, and slightly tangy (probably due to being slightly unripe). This I would definitely continue to buy. And it was the cheapest too! Eventually we discovered that a) it was a guava, and that b) it was not quite ripe yet. The seeds were still extremely hard, and the flesh was crisper and less sweet than it should have been. It was not unpleasant tasting, but it was hard to eat, and not very satisfying. Lucky for us, we bought two of these, and the other one is sitting ripening on the bench as we speak. Hopefully we get a more pleasant guava-experience soon. And that was that. This was not a difficult challenge really (although, with different fruit, it potentially could have been), but it was fun. I certainly wouldn’t have picked up most of these fruit without a reason. 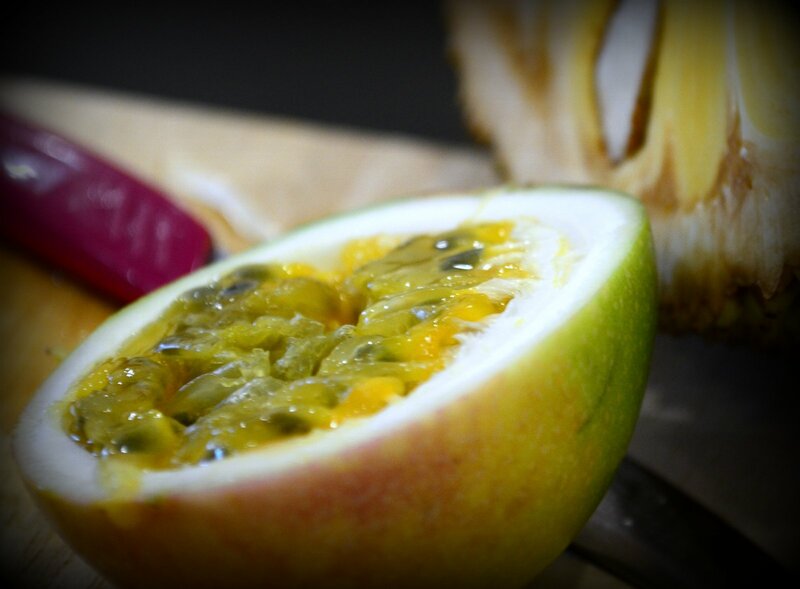 I never would have known that the best passionfruit I’ve ever tasted were right under my nose. And really, I can never complain about a market-shopping experience. 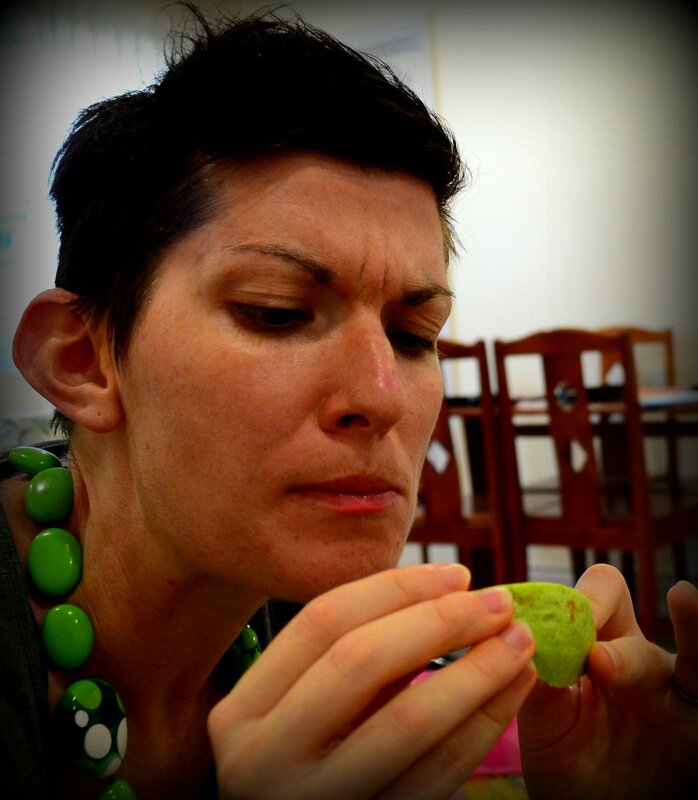 Me and my guava tasting face.